Cherri Bomb: Teen band’s strategy for beating the critics – Live! Starring ... You! LSY! 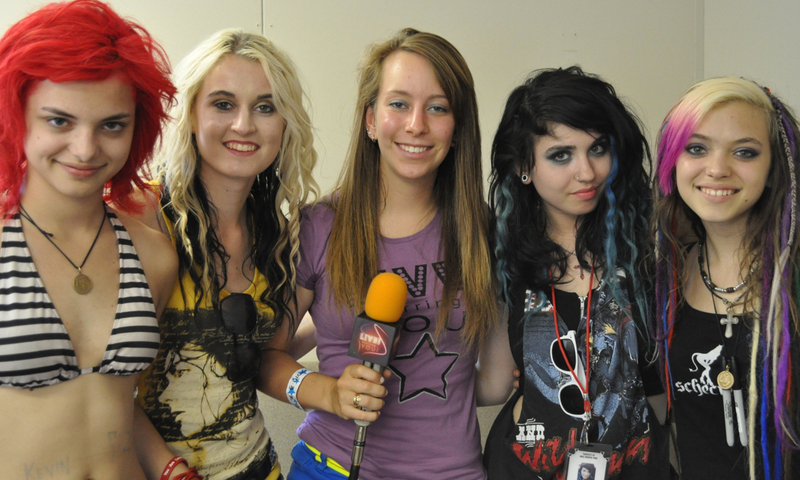 reporter Mary Hartrich after her interview with Cherri Bomb which includes, from left, drummer Nia Lovelis, guitarist Miranda Miller, guitarist Julia Pierce, and bass player Rena Lovelis. When they walk into a room, you’ll notice the candy-apple hair, rainbow dreads, fishnet stockings and loads of bracelets. “When we’re on tour … some people think we’re groupies,” says one. These four girls – ages 14 to 16 – are Cherri Bomb, an rock band signed to one of the world’s most prominent labels, Hollywood Records. Their sound is influenced by bands like the Foo Fighters and Smashing Pumpkins— and they’ve actually opened for those very bands. 2. The best way to beat the critics is to become one of them. Guitarist Julia Pierce, 15, admitted that when people see Cherri Bomb – the only all-girl band on the 2012 Vans Warped Tour – they’re sometimes mistaken as groupies. That’s what happens when you look young and dress like a rock star. The difference, of course, is they are budding rock stars, and they don’t talk or perform like kids. Cherri Bomb formed in 2008 when then 11-year-old Julia Pierce posted flyers seeking musicians around Los Angeles. Soon she was joined by Miranda Miller, and sisters Rena and Nia Lovelis. They were signed by Hollywood Records in 2011 and have since played on stages around the world. Meet them, and you’d never guess they’re only in high school. When you’re young its easy to think that you won’t be able to follow your dreams. But if you have the motivation, you can take those dreams, combine them with talent and hard work and chase your goal no matter how old you are. As a performer, of course, you want your name “out there.” But that means that people will start having opinions about your work, and they won’t all be good. The comments section on YouTube can be a fun place to look when people enjoy your work. But when they don’t, it can be discouraging. “I try not to look at any of our video comments or reviews,” Rena said. Instead, the girls get critical on themselves. After every show, they review video and critique themselves. Learning from their musician parents, they pick apart their performance and work on improving their music and their stage presence. In rehearsals, the girls even use mirrors to perfect their performance. “We’re always working to put on a better show,” said Rena. It works. Check out Cherri Bomb and you’ll see for yourselves: These girls blend superior musicianship with a hard-rocking, expressive performance reminiscent of old-school MTV. Most people love it. Some don’t — and that’s cool too, because when the criticism comes, it only pushes them rock harder. Click here to read our Q&A with Cherri Bomb. Keep up with Cherri Bomb on Facebook, Twitter, Vevo and YouTube. « Think you’re in love?